If those lines are familiar to you, you’ve got a pretty good idea of how scary you can expect Scary Stories to Tell in the Dark by Alvin Schwartz to be. A collection of urban legends, scary stories, and miscellany, Scary Stories to Tell in the Dark and its sequels were the most frequently challenged books during the nineties, according to the American Library Association. If the stories aren’t so scary (and most of them aren’t), then why would people want to remove them from libraries so badly? I can’t speak for those who’d censor books, but I’d like to point out one of the book’s illustrations, drawn by Stephen Gammell. For a children’s book, that’s downright terrifying. I was definitely frightened by these illustrations as a kid. In fact, they’re still pretty unsettling. It’s fortunate that the stories are much less frightening. The book consists of five sections, each containing several stories, along with a few sections of notes, at the end. The first section, “Aaaaaaaaaaah!”, contains “jump stories.” These are stories which are to be concluded by the storyteller screaming and lunging at the audience. They’re not particularly scary, relying, I suppose, more on the storyteller’s screaming than the story itself. “Me Tie Dough-ty Walker!” is pretty memorable, though. The second section, “He Heard Footsteps Coming Up the Cellar Stairs…”, includes some more traditional ghost stories, including “The Haunted House”, which the above illustration belongs to. The third section, “They Eat Your Eyes, They Eat Your Nose”, contains some less common stories, like “The Wendigo”, and also “The Dead Man’s Brains”, the game where you pass around things and claim they’re something frightening or disgusting, such as saying that cold spaghetti is worms, or that peeled grapes are a dead man’s eyes. The fourth section, “Other Dangers”, contains urban legends, such as “The Babysitter”, quoted earlier. The fifth section, called “Aaaaaaaaaaah!”, like the first, contains stories meant to be funny, rather than scary. These sound like they’re going to be scary stories, and then have a twist to make you laugh. After the stories, you’ll find a detailed notes and sources for the stories, along with a bibliography for those interested in further reading. It’s pretty unusual: the stories are written at a level that even children in elementary school can understand, but the end notes are quite detailed, as though Scary Stories were intended for people with a serious interest in folklore. It is quite interesting to read about the variations in the stories, and how they were collected, but I’m not sure I thought so when I read it for the first time, in elementary school. Scary Stories to Tell in the Dark had two sequels, More Scary Stories to Tell in the Dark and Scary Stories 3: More Tales to Chill Your Bones. 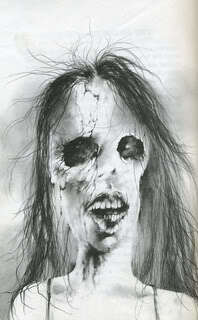 I think everyone ought to read Scary Stories to Tell in the Dark, for the illustrations if not for the stories. You’ve got to be careful, though–there’s a new version with illustrations by Brett Helquist, but it’s just not the same.